Gillespie Insurance Services helps people and small businesses in Southern California with their insurance needs. The family-owned insurance agency and brokerage based in Redlands, CA. We’re a family-owned insurance agency and brokerage based in Redlands, CA that provides specialized insurance services for specific types of businesses. Our roots are in agriculture and we’re still grounded there, although we’ve branched out and learned how to properly insure a few other types of businesses as well. We’ve been around since 1986 and are rolling with the changes as we get deeper in the 21st century with its unique challenges and ways of doing business. We like to think of ourselves as classic, yet relevant. You might be asking: those “specific types of businesses” mentioned above – what are they?” That’s a great question. Scroll down a few inches and find out! Also, please browse around our site and get to know us! Meet our team here. Oh, and one more thing: in addition to insuring businesses, we also insure people and the things that matter most to them like their homes, cars, boats motorcycles, etc. You can also read about them when you scroll down. 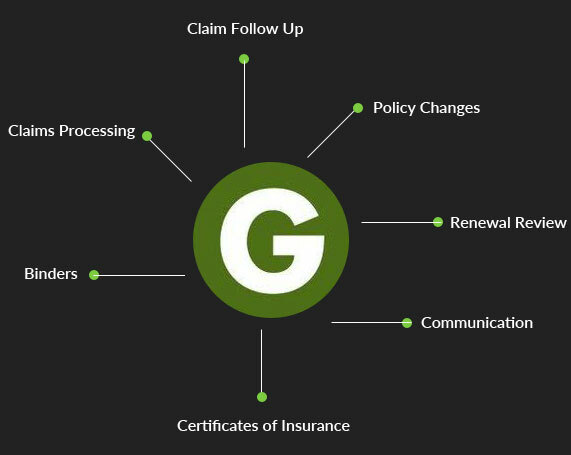 What makes us different than other insurance agencies? We live by the promises we make to you. We are continual learners and we update our insurance knowledge regularly. We value communication, understanding, and setting expectations. Our standards of service are based on putting ourselves in your shoes first. It’s been our pleasure to work with Gillespie Insurance, as a small business it’s nice to have an organization that looks out for our best interest with or changing needs. As our business changes Gillespie Insurance has provided what we need to protect our company and employees. First of all, you and everyone that works for Gillespie are just terrific!! Your service is the best. For all the 5 years or more that we have been working together there are absolutely no regrets. The lord brought you our way in His perfect timing. Thank you, & God bless all your endeavors! Gillespie Agents know the intricacies of insurance and can offer the best fit for our particular circumstances. They have extensive experience with the specific requirements of agriculture as well as home, auto, umbrella and special insurance needs. I would highly recommend them. Get the insurance I needed to move forward with my home purchase in a timely manner and provided me with a quote that was feasible for my needs. My questions were answered promptly and took the care and consideration to make sure my home purchase went through without any issues. If you want to contact one of us directly, go to our Meet Our Team page which has all the info you need.